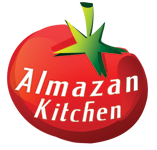 Today we will make an interesting combination of two dishes using the magic of AlmazanKitchen passion = Khachapuri on the pizza base! What is the Khachapuri? Khachapuri is a traditional Georgian cheese-filled bread with many variations of the dish. Today we chose the Adjarian variation of khachapuri but on the pizza round dough with fat outer rim! We added some Camembert cheese, few quail eggs, and finished everything off with Balkanian kajmak and handful of chopped young onions. Nourishing, awesome and easy to make! Mix 1 hand of flour with ½ hand of water, 1 tsp. of salt and 1 tbsp. of yeast. Knead well, form a ball! Attenuate and flatten out the dough into pizza round with fat outer rim. Slice 60g of camembert cheese into few triangles. Place it on the dough. Add 1-2 tbsp. of kajmak, spread it on the dough. Preheat the stone cooker and the round wok pan as a lid. Place the khachapuri-pizza on the preheated stone cooker, cover above with the round wok pan. Bake until crispy crust and melted cheese. Finish off with handful of young chopped onions!